The speakers are for 90% responsible for the sound, when you have only little cheap pc speakers the sound quality is not optimal. The speakers itself are often not of a very good quality; furthermore they are often on an unfavorable place: The sound comes from under the organ and disappear between your legs. The digital organs itself use often 6 or more channels (speakers) and have a separate woofer for low tones, through that it sounds usually reasonable good. But you can use the AUX-input mostly only for 1 stereo signal. The (separate) speakers in the organ are usually not usable from "outside" (via Aux-input). A 'hobbyist' can disconnect the 'internal speakers' from the 'internal amplifier of the organ' and link it to the sound card, used for Hauptwerk. The consequence is that you can no longer use the sound of the digital organ. You can always try it, but for me (and others) it sounds not optimal. Connect the output of your sound card to the input of your Hifi installation. On my home sounds the Genelec Active Speakers a lot better than my Kenwood Hifi (2x 90W) set. But, without a doubt, with a good receiver/amplifier you can also reach a good result. These are speakers with an internal amplifier (also named Studio Monitors), you can connect them direct to your sound card. I have two Genelec 8040A Studio monitors. Before I used a Kenwood Hifi set with 2 Kenwood speakers (2 x 90W). But the sound of the Genelecs is incredible better, it is very close to the sound quality of a good headphone. I have the volume at a maximum of about 50%, probably a cheaper version (Genelec 8030A) was also sufficient. The advantage of the 8040A is that they also support quite low frequencies (48Hz). Studio Monitors have often a balanced input, these give the best performance when the sound card have a balanced output. On Hauptwerk forum: Audio System -- point me in the right direction? On Hauptwerk forum: MW 3-31. Dry sample recordings?? With Hauptwerk Advanced you can send the sound to multiple audio channels. For example you can split stops (or individual notes) to several channels. You need a sound card that supports multi channels. The Multi Channel audio is the most expensive way, do it only when you have already experience with Hauptwerk. Besides, it's not always nicer, it's better to have two good (active) speakers (with an easy stereo configuration) than a lot mediocre speakers! Look to the experiences of other Multi Channel users on the Hauptwerk forum. I bought a multi channel sound card for experimenting with multi channel and Surround. A Surround configuration, with the speakers in a Surround arrangement, gives an enormous improvement on the spacial effect. Take care that the headphone supports low frequencies for the 16 (32 Hz) and 32 feet (16 Hz) stops. A good quality headphone is a AKG K 601 or a AKG K 701. Don't buy a wireless headphone, then you have usually less sound quality with more noise. CAUTION: Many sound cards don't have a headphone connection (+ headphone amplifier), this is the case for e.g. the EMU 0404 and 1212M. The sound card must be connected to an amplifier, the headphone must be connected to the amplifier. It is enormous important where the speakers are located, low on the ground sounds almost never optimal. Listen you stereo than is 'ear height' the best option. Try to put the speakers on the organ console, or better on ear height and then on 1 to 2 meter distance. Experiment and try several possibilities. Problem is that you can often not place the speakers on the right position because of an aesthetic point of view. With an active subwoofer you can hear the 16 and 32 feet stops in the most optimal form. A 16 feet stop has as lowest frequency 32 Hz. A 32 feet stop has as lowest frequency 16 Hz. Normal speakers supports in general only frequencies from 50 Hz and higher, not sufficient for 16 and 32 foot stops. CAUTION: Subwoofers are relative expensive. How more bad the main-speakers, how more adds a subwoofer. Because I had good Genelec 8040A speakers (goes to 48 Hz linear), the addition of a subwoofer was not a big improvement when you take into account the price. Connect the subwoofer on a separate channel of the sound card (only possible with a multi-channel sound card). Configure in Hauptwerk only 16 and 32 foot stops to that channel (only possible with Hauptwerk Advanced). The 16/32 feet stops are fully independent produced, the subwoofer and the other speakers have now absolutely no overlapped frequency range. The overtones (harmonics) of the 16/32 feet stops are not produced optimal. This spends an extra channel on the sound card. The subwoofer uses the same sound signal as the other speakers. Configure in the subwoofer a 'cross-over frequency' (only signals below that threshold frequency are produced by the subwoofer). That is to prefent that the subwoofer and the other speakers both produce sound for the same frequency range, that is not nice. The subwoofer works as an addition on the other speakers, overtones (harmonics) of the 16/32 feet stops are produced by the other speakers. The subwoofer itself mixes often the stereo input signal to mono. It spends no extra channel on the sound card. Not all subwoofers support a 'non amplified' (direct from sound card) signal. You must configure a cross-over frequency to prefent overlap in the frequency range of the subwoofer and the other speakers. LFE (Low Frequency Effect) input, this input supports a non amplified mono signal, but for this input the cross-over frequency configuration doesn't work. A High Level Input, this is the preferred input (by R.E.L. ), but needed an amplified (stereo) input signal and can not connected directly to the sound card. Because I have active speakers (and so not an amplified signal available) I can't use this input. 2 balanced XLR inputs for an un-amplified input signal. This is connected to my sound card. 2 balanced XLR outputs which are connected to my active speakers. No basreflexport. A basreflexport works a bit slow and that is annoyingly for usage in combination with Hauptwerk. For this goal a closed system is better. Pay attention of the input possibilities of a subwoofer for usage in combination with active speakers. The most ideal is to have a subwoofer of the same brand which is tuned to the active speakers. E.g. for Genelec: Subwoofer 7060B or 7070A for 8030A / 8040A active speakers. Hereby a number of examples of audio arrangements in rising quality (and price) order. I use Genelec (Top quality) as examples, other more cheap (e.g. Behringer) speakers are also possible. Remark: This option gives the best result, but you need the same speakers for Lx/Rx and they must be on almost the same location. I have configuration 4b / c, but with 2 front speaker pairs and 1 subwoofer in the middle. The V-Touch itself has 2 good speakers and a subwoofer in the middle. Furthermore, I have 2 Genelec 8040 speakers, which are now above / behind the organ (see photo). The pedal and 16 registers are always configured via the V-touch (and subwoofer). For samplesets with two manuals: one via V-Touch, the other via the Genelecs. For bigger samplesets I distribute the stops over the two stereo pairs (V-Touch and Genelecs). This arrangement gives an extra feeling of space. Wet (or Surround), the samples are recorded inclusive the reverb of the church. The samplesets are often recorded on a distance of about 5 to 10 meter from the organ. Dry, the samples are recorded without the reverb of the church. The recordings are mostly mono and recorded nearby the pipes. You must add artificial reverb because (organ) music without reverb sounds not pretty. It sounds a lot more realistic than Dry. The sound quality of a church organ is for a large part dependent on the acoustics of the room. With other words: The acoustics determines the sound of the organ, it is a part of. For pure Stereo audio, e.g. a headphone or 2 speakers is a Wet sampleset (almost) always nicer than a Dry set with additional artificial reverb. You can not use a Wet sampleset in a room with large acoustics. Then you have reverb over reverb, that's not nice. You can use the sampleset also in a room with large acoustics (e.g. a church). A Dry sampleset requires (a lot) less of the computer (memory / processor capacity). You can complete configure the amount (and type) of the additional reverb and so optimal tune to your room. Especially for Dry samplesets has a multi channel (more speakers) audio configuration a big positive impact on the sound quality. The Dry sampleset organ sounds considerable different than the original recorded organ because the character of the organ is for a large part dependent of the acoustics of the church room. Via the sound card (not all sound cards have this possibility). - Uses no processor capacity. - The result of the other possibilities is usually better. Via a hardware module, for example a Lexicon MX200, MX300, MX400 or MX500. Via software, see below mentioned links of the Hauptwerk forum or: How to add reverb?. - Gives with 'impulse responses' a very good result. - Has (sometimes) a negative impact on the latency. - Works not (always) with a 64 bit Operating System. In the future via Hauptwerk. For home usage, I have a big preference for a Wet (or Surround) sampleset because of the reality. On Hauptwerk forum: Samplesets - dry or wet? On Hauptwerk forum: What to do about 64-bit reverb!? 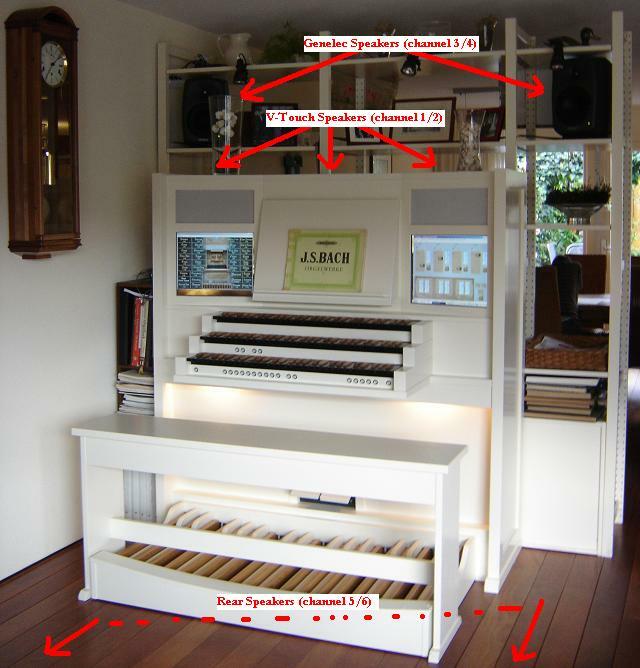 On Hauptwerk forum: Dry samplesets of symphonic organs for live performance? It is better to have two good speakers than a 'multi channel configuration' with a lot of moderate speakers (for Wet samplesets). Listening via a good headphone give the most realistic reproduction of the recorded sound. I agree not full... In, for example, a church you receive the sound not only from the side of the organ, but from all sides (because of sound reflections of the walls). Two microphones in the front of the church nearby the organ (front), this stereo-channel contains the direct recorded organ sound with a bit reverb. Two microphones in the back-side (rear) of the church, this stereo-channel contains more reverb than direct organ sound. Two microphones in the front of the church nearby the organ (front direct), this stereo-channel contains the direct recorded organ sound with almost no reverb. Two microphones in the front of the church at some distance of the organ (front diffuse), this stereo-channel contains the recorded organ sound with some reverb. For the sound quality and realism is, in my opinion, Surround the highest attainable (after headphone, for now). You need two extra speakers (and cables) on another location. You need a multi-stereo-channel sound card (for example Focusrite Saffire or EMU 1616M). The Surround versions of a sampleset are a bit more expensive. The Surround versions use two times (or a bit less when you load the rear channels with e.g. 14 bit, single loops) more RAM memory. The Surround versions use two times more processor time. It sounds a lot more spacial because of the sound (mainly reverb) comes also from behind; you experience not only a left-right dimension, but also a front-rear dimension. You can dose the amount of reverb somewhat through changing the volume of the rear channels. Nowadays most of the surround sets have a 'slider' so you can real-time adjust the volume balance between the different channels. Sent the 'normal stereo signal' to the 'front speakers'. Add a lot reverb (e.g. via sound card) to the 'normal stereo signal' and sent that to the 'rear speakers'.